Hamlin Lake Fireworks begin at dark (about 10:15 PM EDT) from Camp Douglas Smith directly across the lake from Wilson Hill Park on Barnhart Road. Best viewing is by boat in the Upper Lake from Indian Pete Bayou west to Victory Park or on the South shore of the Upper Lake. For safety reasons spectators are not permitted on the grounds of Camp Douglas Smith and viewing from the North Shore is limited to private properties. This is a true community tradition on Hamlin Lake. Starting in the 1970s, residents in the Indian Pete Bayou area began a fireworks presentation. They were soon joined by boaters and other residents with a view from the Upper Lake. It is estimated that more than 4,000 viewers now enjoy this annual event. An ice cream social is held at Wilson Hill Park prior to the display. Special appreciation is due the Grant Twp. Fire Department and Mason Co. Sheriff's Department for providing superb assistance in making this a safe event and to John Quiring for use of his property. Donations are requested. 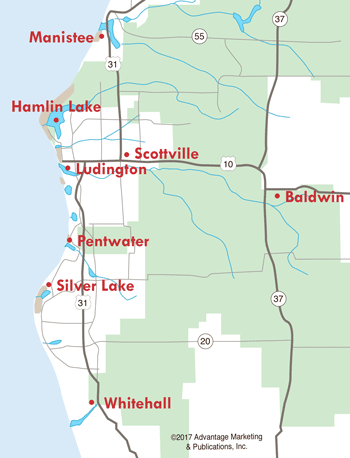 Contributions may be sent to HLPS (Hamlin Lake Preservation Society), PO Box 178, Ludington, MI 49431. The HLPS has been part of the lake's fireworks display since 1985 and the sole sponsor since 1994. The annual cost exceeds $6,000 in addition to the volunteer efforts related to permits, setup, publicity, insurance, cleanup, etc. Some longtime contributors continue to make substantial gifts and several resorts help defray the costs; however the total number of donations is given by only a small percentage of the viewers. Your help will be appreciated. 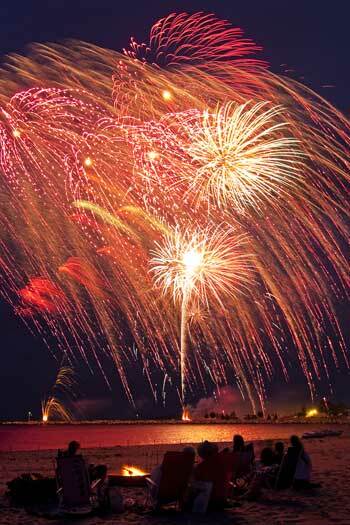 For more information regarding the fireworks, you may contact Kent Gage at (231) 843-3169, khgage@aol.com.